The Leader in Pro Bass Fishing News! Jason Christie now two B.A.S.S. wins at Lake St. Clair/Detroit River. 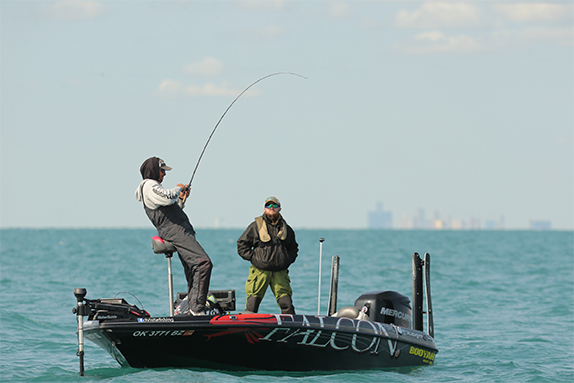 Jason Christie is a creature of habit somewhat, at least at Lake St. Clair. When the Oklahoma resident won the Detroit River Northern Open in 2012, he spent his tournament in Lake St. Clair, in an area near the mouth of the Detroit River, ripping a tube out of and through some grass. He caught 22-13 on the final day to overcome a deficit of less than a pound. Fast forward 5 years and that�s exactly how he captured the win in last week�s Lake St. Clair Elite Series. The only difference was the location changed. This time he was in Canadian water, off by himself, in his glory, ripping a tube off the bottom in 19 to 22 feet of water. 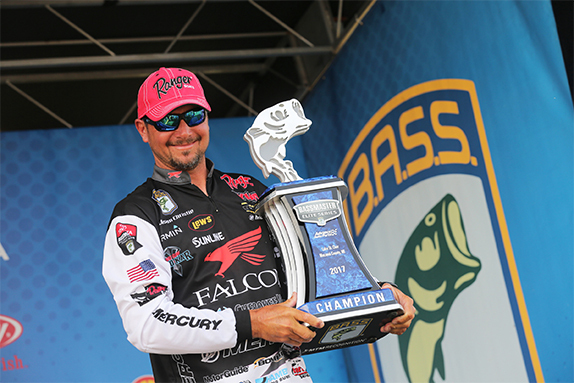 His 22-00 stringer on Sunday was the heaviest among the 12 finalists and it helped him erase a daunting 3-pound, 4-ounce margin. This is Christie�s third top-10 and second win at St. Clair in B.A.S.S. competition, a startling stat for a Midwesterner known for his shallow-water prowess. He maintained a 22-pound daily average by settling into an area during practice and patiently narrowing his options during the tournament. At one point, he had a handful of smaller areas about the size of football fields. By Sunday, he winnowed them down to patches roughly equivalent to a basketball court, fitting for the former college hoops standout. During practice, though, he was a bit anxious because he wasn�t sure he�d be able to zero in on where the bigger fish were in such a big area. In hindsight, he was right where he wanted to be. He made repeated drifts, stayed patient and tried different presentations, which all led to his ultimate success. �I had a 2-mile by 2-mile area,� he said. �It�s big, but I could fish and get bites there. I think I found the area (in practice), but I hadn�t found the spots. That�s good because in the tournaments I�ve won I always figure it out during the tournament. Here are some additional details about how Christie clicked with St. Clair yet again. Christie had his mind made up before he even arrived in the Detroit area that he was committing to Lake St. Clair. In trying to sample it all, an angler can get overwhelmed and also get caught up in catching 3-pounders, which were of little help (and in relative short supply) last week. That�s why Christie forces himself to pick an area and dissect it to find the smaller sweet spots. 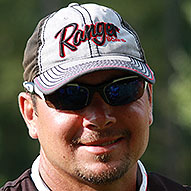 Christie started the tournament with a 21-12 bag that had him in 4th after day 1, but he still felt unsettled. He fished a number of spots in the 5-mile area he found in practice and had success on several drifts, but he didn�t feel like he was narrowing anything down. Compounding matters was the lingering wind that made being efficient a challenge. He weighed in one fish he caught on a Bomber crankbait and the rest came on a tube filled with a 1/2- or 3/4-oz. tube jig. The prevalent sunshine and high skies on Friday and Saturday were key to triggering the bigger fish to bite, he said. He relied heavily on his Garmin electronics throughout the event, so much so that he purposely avoided areas where the sand grass was taller than a foot off the bottom. Christie caught the majority of his fish ripping a tube out of grass using bait casting gear. �The west side and the south side have a lot of grass that�s tall,� he said. �The sole reason that I ran away from that grass was because of my Panoptix. (That grass) takes my advantage away of seeing them out there 80 feet from the boat. In addition to the nearly 90 pounds of bass he caught, he reeled in �a truckload� of drum and some of those helped to give away the location of curious smallmouth that would accompany the drum on its way to surface. The common attractant across all the areas he fished was the presence of crayfish. With very little contour change across vast sections of St. Clair, he kept trying different depth zones just to see if he could collide with another group of bass. The tube was his primary weapon on Friday and Saturday � he weighed in one on a dropshot each day ��and everything he caught Sunday fell for the tube. > Tube gear: 7�3� heavy-action Falcon Rods Cara T7 casting rod, Team's Lew's Custom Pro Speed Spool SLP Series casting reel (7.5:1 gear ratio), 10-pound Sunline Super FC Sniper fluorocarbon line, 1/2- and 3/4-oz. tube jig, 4� YUM tube (green-pumpkin). > Dropshot gear: 7� medium-heavy Falcon Rods Bucoo SR spinning rod, Lew's Mach II Metal Speed Spin spinning reel, 16-pound Sunline SX-1 braided line, 8-pound Sunline Super FC Sniper fluorocarbon line (leader), 1/0 Lazer TroKar dropshot hook, YUM Warning Shot (green-pumpkin purple), 1/2-oz. unnamed tungsten dropshot weight. Much of the tackle referenced above is available at the BassFan Store. To browse the selection, click here. Lake Norman � "It's clear and it gets a lot of pressure, and it seems like everybody ends up fishing on top of each other." "I had an uncle named Duck. We have a big family and he was kind of the leader of the family. He was a big deer hunter and he fished some regional tournaments." "It's a combination of the competition and just being outdoors." Click here to view tournament data for this angler. *BASS events (all events because BASS does not report Tour and Open earnings separately) and FLW Tour. Brandon Palaniuk is always about making a big splash, especially when he�s fishing large, oversized swimbaits.